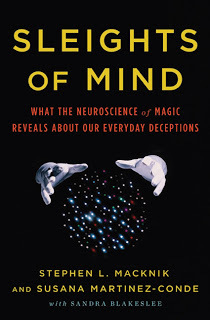 Aside from being interesting for anyone who is curious about how magic tricks work (or about how to be less gullible in general), Sleights of Mind: What the Neuroscience of Magic Reveals about Our Everyday Deceptions is a pretty fascinating book for writers, mainly because of all the parallels between creating illusions on the stage and on the page. Writers do this too: they perform mental jujitsu to create sensory deceptions (visual, audio, textural) through verbal art rather than performance art. Good writers need to be masters of human observation so they can understand how an audience experiences their “show,” and this is what Sleights of Mind is all about: audiences. The book explains what’s going on in the minds of your audience and how to exploit this knowledge to create fantasies that seem like reality. It also offers some interesting insights into how mirror neurons work (mirror neurons are responsible for our ability to empathize with others and to imagine what they might be experiencing). These neurons create our “mind’s eye,” which is probably the same thing authors hijack to make readers feel and sense the experiences of fictional characters. There are other similarities between these two arts. Magicians manipulate the audience’s “spotlight of attention” to hide the trick behind the illusion. Writers do a similar thing when they insert subtle foreshadowing (the set up) between layers of story and description. The foreshadowing gives the reader a sense of resonance when it comes back into play later, but because it’s slipped in subtly while the reader is distracted by the other things going on, the ending seems unpredictable and surprising, but also inevitable. Magicians use habituation to lull their audience, and writers, whether consciously or unconsciously, use this repetition technique too: characters try to reach their goals several times over and fail, or certain scenes will echo one another, all to increase the surprise and wonder of the shock awakening at the end. Just as in a magic show, the audience knows all along that everything is a pack of lies, but they want to be deceived. They appreciate and will pay good money to a confident and skilled illusionist/writer who allows them to suspend their disbelief and be fooled. It’s a strange but beautiful relationship. Many more of the techniques explained in this book could be translated into storytelling tools that will help writers gain a more conscious control of their verbal spells. I’d recommend it if you’re a the kind of person who enjoys doing awful sounding things (exploiting human gullibility and manipulating vulnerable minds) to create beautiful art and invoke a sense of wonder.